I don’t usually make any announcements on this site. Sure, I’ll spew anger about customer service, or discuss my experiences with dropping cable, but the majority of my articles are focused on software development. Yesterday, however, HTC announced two new devices for the Mango release of Windows Phone, and they’re just too cool not to talk about. 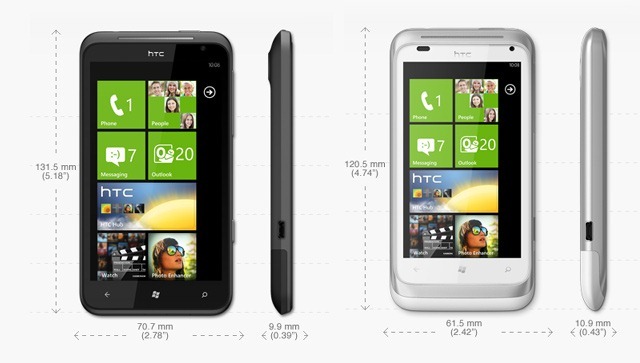 They are the HTC Titan and the HTC Radar. In terms of unique good looks, this is probably the prettiest Windows Phone I’ve seen so far. I’ve seen some blurry screenshots of some Nokia phones that are coming, but until they’re announced, this one is the king. It’s got all of the goodness of Mango pre-installed, so that’s a huge plus, but it also includes a front-facing camera. We’ll have to wait to see the specifics on how that will be used. While certainly not nearly as attractive as the Radar, Titan’s got specs that would make most phones blush. Up to TEN hours of talk-time battery life. The HTC Titan, like the Radar, is also cut from a single piece of metal, which gives it a much more solid feel in your hands. I will likely be looking to pick up a Titan when they come out, assuming it lands with the right carrier. Which one would you pick? This entry was posted in Windows Phone. Bookmark the permalink. ← What’s in your laptop bag? I’ve got my eye on the Titan too. Looks like a pretty sweet phone. I’ll probably upgrade as long as AT&T (assuming they get it) doesn’t charge too much to upgrade from my Focus. I’m assuming either HTC will have their own video-chat app bundled, or they put it there knowing that those types of apps can be built now with Mango and will probably arrive soon. I’m also assuming that with Microsoft’s purchase of Skype we’ll be seeing Skype on the phone at some point in the future. I know that T-Mobile will carry the Radar … and I’m really hoping they will get the Titan as well (I really want the Titan).. and yes, if they carried it, that’s the one I would get.